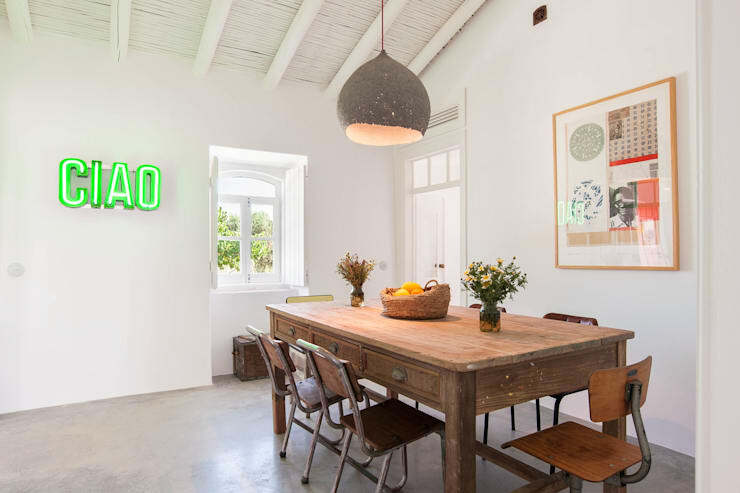 Situated near Algarve, Portugal, this once picturesque farmhouse was lying abandoned and derelict. 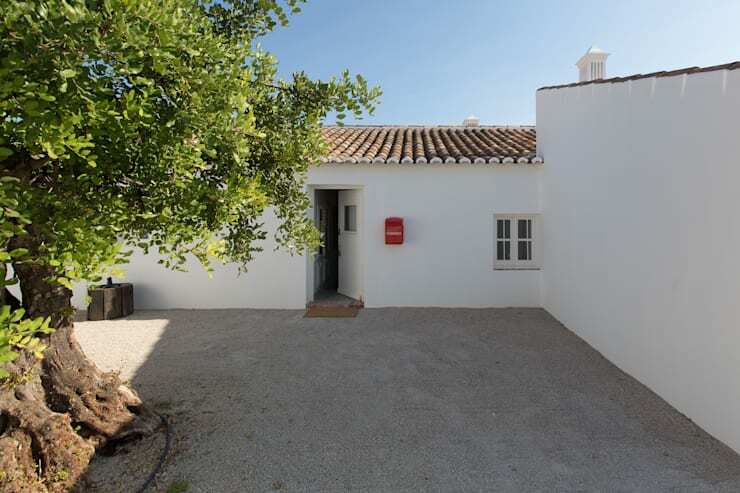 But Atelier Rua – Arquitectos, architects from Lisbon, saw its immense potential and were thrilled to lend the house a charming facelift. Thanks to them, the house retains its traditional, rustic beauty despite a stunning makeover. Like other homes in its vicinity, this farmhouse too features crisp white walls and a conventional roof. But the architects have enhanced its aesthetic appeal innovatively, which will become evident once we explore more. Both the interiors and the exteriors have been modernised to cater to the vacation needs of a family. The farmhouse serves as a countryside getaway and helps in reconnecting with nature. The incorporation of large fruit trees has now completely transformed the arid surroundings of the abode. 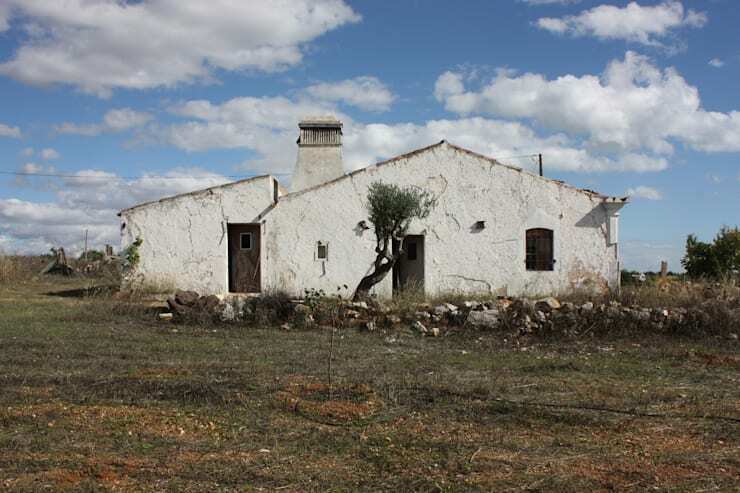 Before the makeover, the farmhouse lay dilapidated and forlorn. The plaster was peeling off and cracks had begun to show. Wild bushes had starting to crowd around the abode in unsightly clumps. But it was once quite active and surrounded by lush groves. So the architects decided to restore the home to its former glory. At present, the house looks like an oasis of peace and tranquillity. 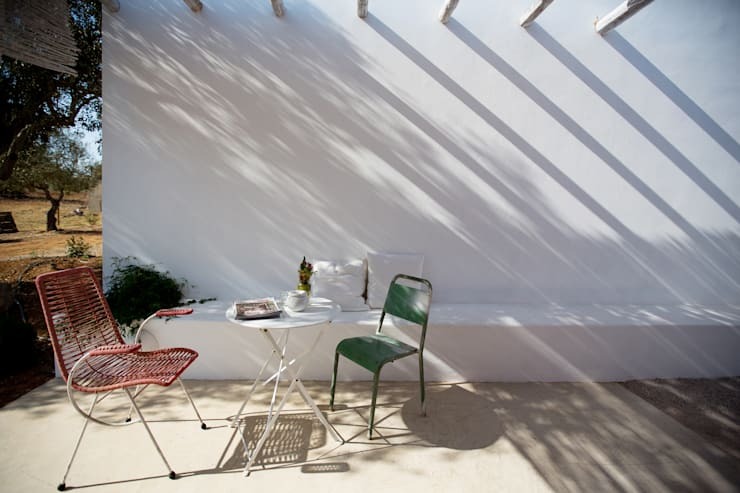 The chic simplicity of white walls gorgeously complements the earthy tones of the roof. The original blueprint has been adhered to, while renovating the main structure. The presence of verdant greenery and a quirky red letterbox add hints of colour to the sober tones of this rural dwelling and the patio. The lounge is minimalistic, elegant and unites the power of sparkling white and wooden hues. A simple inset wall shelf provides adequate space for storage. A modish leather chair, a pristine white couch, a couple of corner tables and an old fashioned bureau make the room well-suited for relaxation and lazy conversations. Mellow and soothing lighting and a rustic mat on the floor are attractive touches. Sunshine and fresh air make this dining area a spot for both gastronomic and aesthetic pleasures. The large dining table oozes pastoral charm, and the shabby chic pendant lighting provides ample illumination in the evenings. A basket of fruits and flowers in homely vases make us feel grounded. The abstract framed art and the stunning green “Ciao” are the more modern touches that this space enjoys. The predominant use of white continues in the bedroom. 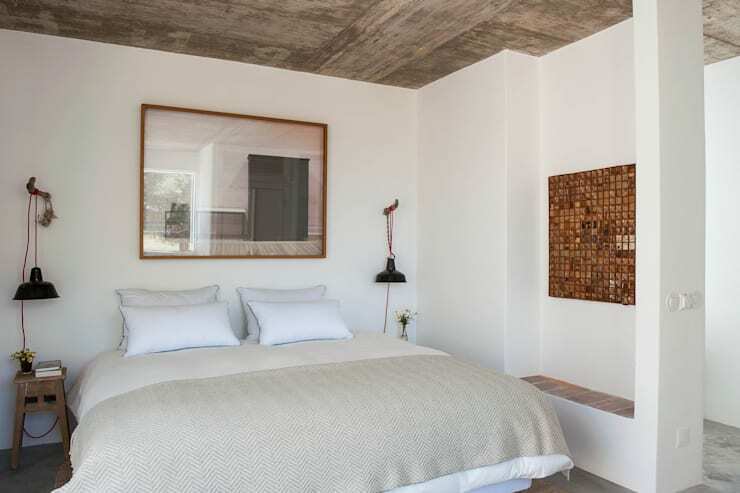 We love how the wooden ceiling lends a warm and cosy feeling, along with the wall arts. The bedside lamps have been suspended from sturdy branches, and the plush bedding promises restful nights. Who wouldn’t want to pull up a chair and soak in some sun, on this long welcoming terrace? 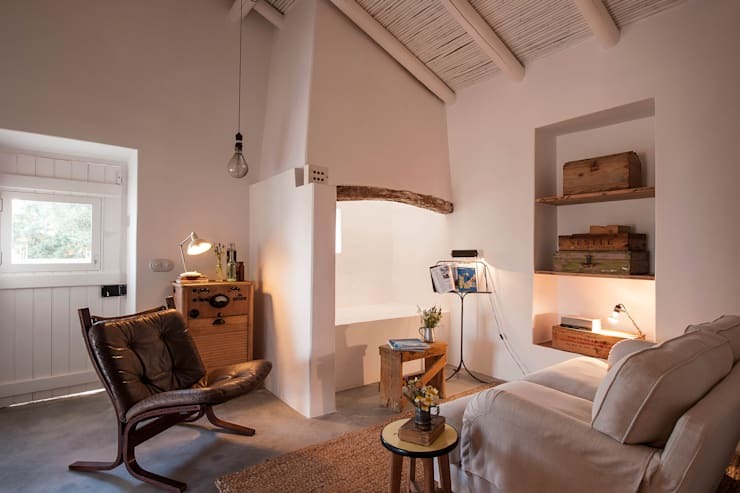 The white walls coexist peacefully with the earthy flooring. Tall trees have found their homes in creative planters, while an overhead trellis-like structure supports the foliage. You can sit here for hours and admire the beauty of untamed nature all around. 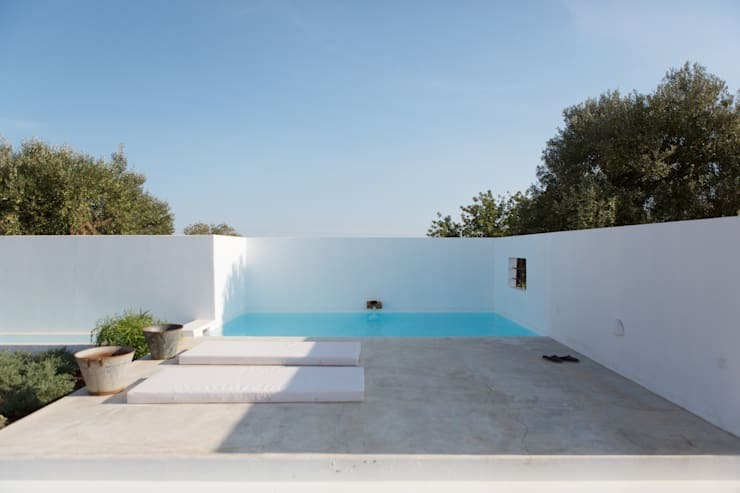 An in-ground pool has been built as a modern and luxurious addition to the farmhouse. The setting is simple but refreshing, and offers much desired respite on a scorching day. Verdant nature surrounds the pool and lets you cherish the simple pleasures of life. Since the property is spread over a substantial area, it abounds in plenty of nooks and corners for socializing. This lightly shaded corner with a couple of bright chairs and a small table is especially well-suited for chitchatting, or exchanging pleasantries over coffee. 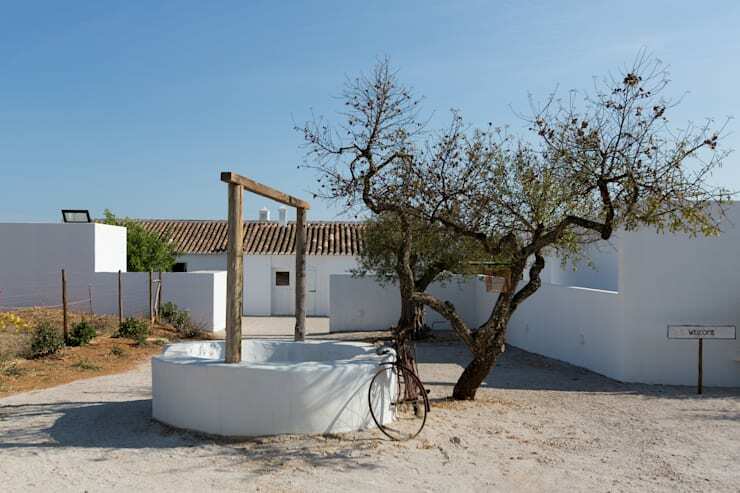 This old-world well was originally a part of the farmhouse, and has been revamped to add a typical rural flavour to the entrance. It is accompanied by a curiously growing tree and a lone vintage cycle. The well is not just decorative; it takes us back to a time when life was more slow paced and magical! 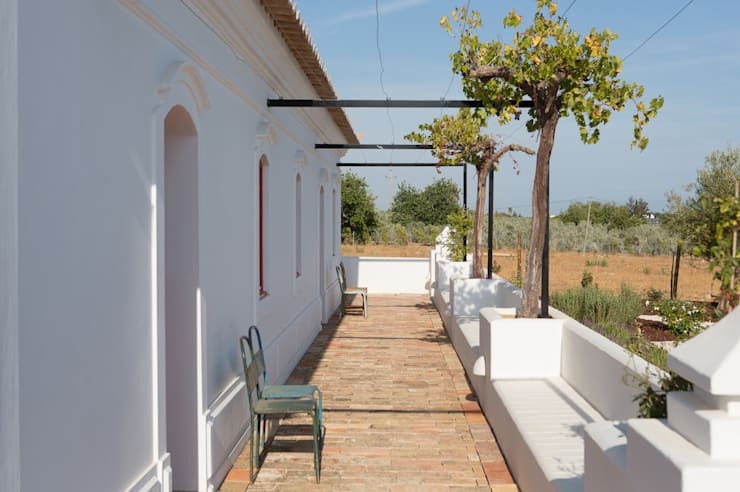 We hope you found the makeover of this Portuguese farmhouse inspiring, and hopefully it has given you ideas about your own project. Here is another ideabook you may love to go through – The magical before and after story of a flat.